I took a walk through the neighborhood this morning. We had a heavy rain last night. And this morning we had a lot of little brown mushrooms growing in the grass. Listed below is what I found (use the following diagram for easier reference). 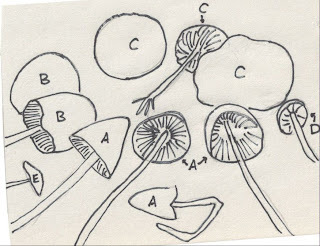 The most numerous mushrooms were species of Conocybe (labeled A in the diagram), also called Dunce Caps or Cone Heads. This particular Dunce Cap is probably Conocybe albipes. It's a common mushroom in lawns, but doesn't last long. The stems are quite long compared to the cap size, and the whole mushroom is pretty fragile. Another feature that sets them apart (if I can say that about a LBM) is the cinnamon brown gills and spores. The greyish mushrooms (labeled B) are coprinoid mushrooms. They had a black spore print. Many coprinoid mushrooms dissolve into black goo, but these did not. They were the only mushrooms not found in the grass. They were growing out of some kind of fibrous erosion control material along the Mississippi River. 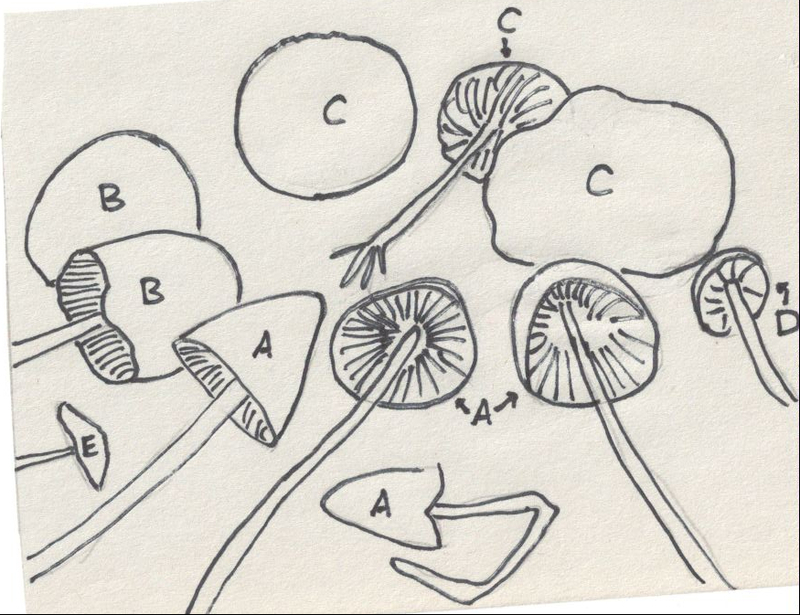 At the top of the picture (labeled C) are three examples of Marasmius oreades, often referred to as the Fairy Ring Mushroom, which is a bit misleading since other mushrooms grow in fairy rings, and M. oreades doesn't itself always grow in a ring. It's a pretty tough mushroom with a white spore print. It is also a common lawn mushroom, and relatively easy one to learn if you care to consult some field guides and go looking. The small mushroom on the right (labeled D) I believe is a species of Panaeolus or Psathyrella. It produced a dark brown spore print. And finally mushroom E. It disappeared somewhere along the very short way from where I took the picture in the backyard to the house where I did the spore prints. It was in the yard, maybe more will sprout up and I'll have a chance for another look.